Blink and you’ll miss her – or will you? Reposting yesterday’s story – this time with photo! 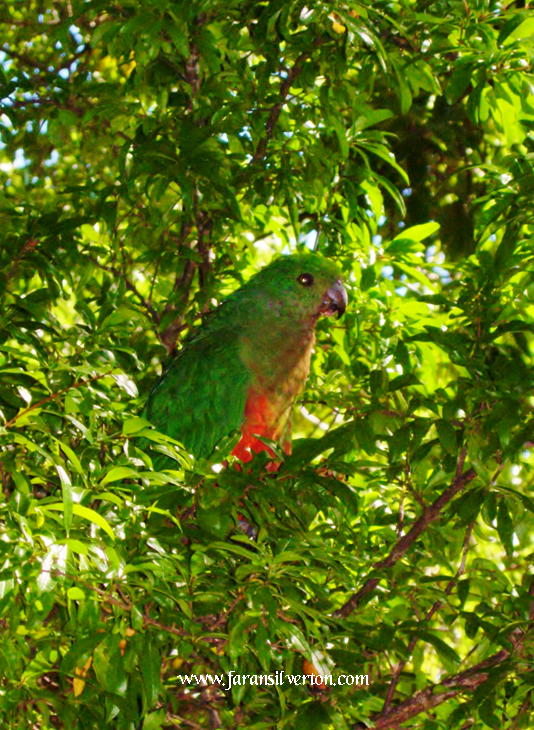 This female Australian king parrot (Alisterus scapularis) and her partner had come down to eat the persimmons in our back yard. We never picked one piece of fruit off that tree, but it was worth it just to see these beautiful birds up close. The more spectacular males have a red head and breast. I’ve read a story told by an Aboriginal elder, in which the king parrot got its red wings by carrying two burning firesticks. I am interested in animals and their behaviour, which feature prominently in my writing, so it was rewarding to get a photo of this special, shy bird. Thank you. They are quite shy birds so it took me several attempts to sneak outside to take the photo without them flying away.